CD4+CD25+high T cells are potent regulators of autoreactive T cells. However, it is unclear how regulatory CD4+CD25+high cells discriminate between desirable inflammatory immune responses to microbial Ags and potentially pathologic responses by autoreactive T cells. In this study, an in vitro model was created that allowed differential activation of regulatory CD4+CD25+high and responder CD4+ T cells. If CD4+CD25+high regulatory cells were strongly activated, they maintained suppressive effector function for only 15 h, while stimulation with weaker TCR stimuli produced regulatory cells that were suppressive until 60 h after activation. In contrast, strongly activated CD4+ responder T cells were resistant to regulation at all time points, while weakly stimulated CD4+ cells were sensitive to suppression until 38 or 60 h after activation depending upon the strength of the stimulus. The extent of suppression mediated by CD4+CD25+high cells also depended on the strength of stimulation in an Ag-specific system. Thus, the stronger the TCR signal, the more rapidly and more completely the responder cells become refractory to suppression. As their deletion in early postnatal life results in multiorgan autoimmune disease (1), CD4+CD25+ regulatory T cells appear to be a highly specialized T cell subpopulation that are pivotal in the control of self responses. These regulatory T cells have an increased propensity for self recognition and exert regulatory function by inhibiting the activation of the targeted T cells in a contact-dependent manner, resulting in the inhibition of IL-2 gene transcription (2, 3, 4, 5, 6, 7, 8). Manipulation of a number of surface molecules including the glucocorticoid-induced TNFR (GITR),3 programmed-death ligand 1, and cell surface-associated TGF-β (8, 9, 10, 11) has been shown to alter the effects of CD4+CD25+ regulatory T cells, thus suggesting that different mechanisms may be used by these cells to induce suppression. It was recognized early on that the nature of stimulation provided in cocultures of CD4+ and CD4+CD25+ cells determined whether proliferative and cytokine responses would be suppressed. In the mouse system, Thornton and Shevach (3) demonstrated strong suppression in cocultures that were stimulated with soluble αCD3 while plate-bound (pb)αCD3-activated cocultures did not induce inhibition. Similarly, cocultures of human CD4+CD25− (CD4+) and CD4+CD25+high cells stimulated with a high concentration of pbαCD3 did not inhibit proliferation, while identical cultures stimulated with a lower, suboptimal concentration of pbαCD3 completely suppressed proliferation and cytokine secretion (8). Similarly, increasing the strength of signal with the addition of soluble αCD28 to pbαCD3 stimulation also abrogated suppression (3, 8). Thus, stimuli that do not result in suppression can be thought of as nonpermissive for suppression, and generally are signals that provide a stronger signal through the TCR. Interestingly, these nonpermissive stimuli, which result in strong T cell proliferation and cytokine production, have traditionally been used to induce T cell clonal expansion. During ontogeny of the immune system, T cells expressing high-affinity TCRs for self Ags undergo clonal deletion in the thymus against a background of positive selection to MHC and self Ag (12, 13). Thus, the resultant T cell repertoire can be viewed as, in essence, an autoreactive population with low-affinity receptors for self Ags. In contrast, with inflammatory responses, the addition of costimulatory signals, including ligation of the CD28 receptor by B7.1 and B7.2, provides for strong clonal expansion of T cells in response to potentially lethal infections. This finding led us to postulate that CD4+CD25+high regulatory T cells selectively suppress target cells that received weak signals lacking costimulation while being unable to suppress responder T cells that had been induced by foreign microbial Ags to undergo clonal expansion via strong signals. For CD4+CD25+high cells to regulate immune responses in vivo, they must also overcome temporal and spatial limitations of activation and target cell interaction. It has been shown in both murine and human in vitro systems that contact is required for suppression by CD4+CD25+high regulatory cells of the target responder CD4+ T cell (3, 4, 8). Regulating responses in vivo is further complicated by the fact that CD4+CD25+high regulatory T cells are found at a much lower frequency than responder CD4+ T cells, representing ∼1.5–3% of total CD4+ T cells in peripheral blood (8). CD4+CD25+ cells express CCR4 and CCR8 chemokine receptors that lead to selective migration to dendritic cells at sites of inflammation and immune activation in secondary lymphoid tissues (14). Presumably, it is at these sites that the timing of activation and contact between the responder and regulatory T cells, in addition to TCR signal strength, determines whether the outcome will be suppression or activation. Thus, it is important to determine whether CD4+ responding T cells remain sensitive to suppression for a certain period of time after TCR activation. If so, the regulatory T cell would have a “window of opportunity” during which it may suppress unwanted responses, such as those against self Ags. We have determined whether varying the strength of signal to either the regulatory or responder T cell influences the kinetics and degree of in vitro suppression. Varied strengths of signals that induced different degrees of T cell activation were simulated by cross-linking the TCR by the differential physical presentation of αCD3 Abs in the presence or absence of CD28 coligation. We also analyzed the suppression induced under different signal strengths for sensitivity to blockade of GITR and TGF-β. The capacity to inhibit TCR signals generated via engagement by MHC presentation of specific Ag was addressed by use of a random copolymer in cocultures of CD4+ and CD4+CD25+high cells. The results demonstrate that highly activated CD4+ T cells, as would occur during inflammatory responses, were absolutely resistant to suppression by regulatory CD4+CD25+high T cells, while weakly activated CD4+ T cells, as would occur during physiologic engagement of TCRs to self Ags in the absence of costimulation, were exquisitely sensitive to suppression. Thus, this in vitro model, depicting the importance of TCR signal strength on both responder and regulatory populations, may reflect the in vivo boundaries of suppression by CD4+CD25+high regulatory T cells. Cells were cultured in RPMI 1640 media supplemented with 2 nM l-glutamine, 5 mM HEPES, and 100 U/μg/ml penicillin/streptomycin (all from BioWhittaker, Walkersville, MD), 0.5 mM sodium pyruvate, 0.05 mM nonessential amino acids (both from Life Technologies, Rockville, MD), and 5% human AB serum (Gemini Bio-Products, Woodland, CA) in 96-well U-bottom plates (CoStar, Corning, NY). The αCD3 (clone UCHT1 for pb assays and clone Hit3a for soluble conditions) and αCD28 (clone 28.2, at 5 μg/ml) Abs were purchased from BD PharMingen (San Diego, CA). For soluble stimulation, the αCD3 (Hit3a) and αCD28 (28.3) were used at a final concentration of 2.5 μg/ml. The αCD3 beads (catalog no. 111.14, with SPV-T3b αCD3 monoclonal) were purchased from Dynal Biotech (Lake Success, NY) and used at a ratio of six beads to one responder T cell per well. For pbαCD3 stimulation, 50 μl of the αCD3 Ab diluted in PBS (Life Technologies) at a concentration of 2.5 μg/ml was added to each culture well, incubated at 37°C for 4 h, and then washed twice with PBS. For the Ab blocking studies, the reagents were purchased from R&D Systems (Minneapolis, MN) and used at the final concentration of 10 μg/ml: mouse IgG1 (MAB002), chicken IgY (AB-101-C), αhTGF-β (IgG1 mAb, MAB240), αhTGF-β (polyclonal chicken Ig,AF-101-NA), and αhGITR (IgG1 mAb, MAB689). Human blood mononuclear cells were isolated from freshly drawn human blood by Ficoll-Hypaque (Amersham Pharmacia Biotech, Piscataway, NJ) gradient centrifugation. The CD4+CD25− (CD4+, or responder T cells) and the CD4+CD25+high (regulatory T cells) were isolated from 1–2 × 108 PBMCs by sorting with a FACSVantage SE (BD Biosciences, Franklin Lakes, NJ). These cells were incubated with 250 μl each αCD4-CyChrome (no. 555348, IgG1; BD PharMingen) and αCD25-PE (no. IM0479, IgG2a; Immunotech, Brea, CA). Monocytic cells were selected against by removing any cells that stained with the αCD14-FITC (LPS receptor, no. 30544X, IgG2a), αCD32-FITC (FcγRII, no. 30934X, IgG2b), and αCD116-FITC (GM-CSFR, no. 18774B, IgM), all purchased from BD PharMingen. The sort gates were restricted to the population of lymphocytes by means of their forward and side scatter properties, excluding large, activated T cells. T cell-depleted accessory cells (TdACs) were isolated by negative selection of PBMCs by incubation with αCD2-coated beads purchased from Dynal Biotech (catalog no. 111.01) followed by irradiation at 3300 rad. In all assays using αCD3 stimulation, the CD4+CD25− cells were plated at 2.5 × 103/well, while the CD4+CD25+high cells were plated at 1.25 × 103/well. Thus upon coculture, the cells were combined at a 2:1 ratio. All wells received 1 × 104 TdACs. To determine proliferation, half of the culture supernatant (100 μl) was removed from each well before 1 μCi of [3H]thymidine (NEN, Boston, MA) was added on day 5 for the final 16 h of culture before harvesting. For the experiments addressing the time course of coculture initiation, the separately stimulated cultures of CD4+CD25−/TdAC, CD4+CD25+high/TdAC, and “TdAC only” were set up in 100 μl total volume, spun gently to initiate the stimulation, and then were resuspended and combined at 15, 38, or 60 h after initiation of stimulation. The time was counted from the initial activation of the cultures, and the assays were all similarly pulsed with [3H]thymidine on day 5, as described above. In the separate stimulation and time course coculture experiments shown in Figs. 2⇓ and 3⇓, the positive control cocultures consisted of responder cell cultures that had been combined with TdAC cultures that had received the identical stimulation as its corresponding regulatory cell cultures. To interpret the data, the results of the positive control cocultures (addition of TdAC-only cells) are compared with the results of the cocultures that had received the identically activated regulatory cells. For the experiments using glatiramer acetate (GA; Copaxone; kindly supplied by Teva Marion Partners, Kansas City, MO), the cultures were activated at the designated concentration and the number of cells was increased 4-fold, although the 2:1 ratio was maintained. These Ag-specific assays were pulsed with [3H]thymidine on day 7 after stimulation. All assays exhibited <10% SEM and were repeated in a minimum of three independent experiments using blood from different donors. The supernatants that were removed before addition of [3H]thymidine and were diluted and analyzed on Immulon 4 ELISA plates (Dynex Technologies, Chantilly, VA) using the Ab pairs: IFN-γ (M-700A and M-701-B Biotin; Endogen, Woburn, MA), IL-10 (nos. 18551D and 18562D-Biotinylated; BD PharMingen), and IL-13 (554570 and Biotinylated no. 555054; BD PharMingen) developed with an avidin-peroxidase conjugate (1/10,000 dilution) (A-7419; Sigma-Aldrich, St. Louis, MO) and tetramethylbenzidine peroxide substrate (no. 50-76-06; Kirkegaard & Perry Laboratories, Gaithersburg, MD). Instead of IL-4, IL-13 was assayed as a prototypical Th2 cytokine due to limitations in the detection of IL-4 in culture supernatants of human T cells likely due to its consumption. As a result of the strength of the generated TCR signals, different methods of CD4+CD25− T cell stimulation cause markedly different levels of proliferation. As shown in Fig. 1⇓, a high concentration of pbαCD3 is a very strong stimulus that when used in the coculture of CD4+CD25− responder cells and CD4+CD25+high cells did not result in inhibition of proliferation. With pbαCD3 stimulation, the coculture exhibited 109% of the proliferation induced by the culture of responder cells alone. The addition of soluble αCD28 costimulation to the pbαCD3 further enhanced the proliferative response and again did not result in suppression of the coculture. In contrast, stimulation with either of the weaker stimuli, bead-bound αCD3 or soluble αCD3 and αCD28, gave lower levels of responder cell proliferation that were significantly reduced by 80 and 73%, respectively, upon coculture with CD4+CD25+high cells. Differential stimulation of CD4+CD25− cells, CD4+CD25+high cells, and their coculture with polyclonal stimulators leads to suppression upon weak stimulation (soluble αCD3/αCD28, and αCD3-beads) or the absence of suppression upon strong activation (pbαCD3, or pbαCD3 with soluble αCD28). Cocultures were set up at day 0 at a 1:1/2 ratio (responder:regulatory) in the presence of the designated stimulus and TdACs as described in the Materials and Methods. □ (CD4+CD25+high), ▪ (CD4+CD25−), and ▨ (Cocultures) represent the levels of thymidine incorporation measured at day 5 from triplicate cultures (mean ± SEM). This is representative of three separate experiments performed with cells from different donors. The previous results suggest that strong stimulation either inactivates the suppressive function of the CD4+CD25+high regulatory cells or induces the CD4+CD25− responder T cells to become resistant to suppression. To address this question, responder and regulatory T cells were separately stimulated with the different stimuli and combined at the indicated times after intiation of activation. As all T cell cultures were stimulated in the presence of irradiated TdACs, cultures of “TdACs only” were also stimulated under the same conditions and similarly combined with the various activated cultures of responding T cells to serve as controls. Thus, the proliferation that resulted from the addition of the activated TdAC-only cultures provided the baseline for comparison of regulatory cell function apparent in the cocultures receiving the identically activated regulatory TdAC cultures. The kinetic experiments were performed three times with cells isolated from different donors, and produced virtually identical results. CD4+CD25+high regulatory cells or TdACs that had been given no stimulation or were preactivated with αCD3 beads (weakest signal), soluble αCD3/αCD28 (weak signal), or pbαCD3 (strong signal) were added to cultures of αCD3 bead-stimulated (weakest stimulus) responder CD4+ T cells at 15, 38, or 60 h after activation (Fig. 2⇓A). Irrespective of the activation signal provided to regulatory CD4+CD25+high T cells, there was strong inhibition of proliferation of the αCD3 bead-activated responder CD4+ T cells when cultures were initiated within 15 or 38 h of activation. As the coculture of CD4+CD25+high regulatory cells that were not preactivated also resulted in strong inhibition of responder cell proliferation at 15 and 38 h, it is possible that the regulatory cells were activated as a consequence of residual αCD3 stimuli. Similarly, the addition of regulatory cells stimulated with either of the two weaker stimuli of αCD3 beads or soluble αCD3/αCD28 resulted in significant inhibition of responder CD4+ T cells in cocultures initiated up to 38 h after activation. Interestingly, the addition of regulatory cells that had been preactivated with the strong nonpermissive stimulus (pbαCD3) was able to suppress proliferation by 90%, but only in cocultures established by 15 but not 38 h after activation. Because the same CD4+ T cells were suppressed at 38 h when combined with regulatory cells preactivated with weaker stimuli, the CD4+CD25+high regulatory cells rapidly lost their ability to inhibit proliferation after receiving strong activation signals. Regulatory and responder T cell cultures were stimulated separately before being combined in cocultures at various times after stimulation. Shown is the proliferation that resulted upon adding CD4+CD25+high cells/TdAC (•) or “TdAC-only” cultures (○) preactivated by the designated stimuli to cultures of previously stimulated CD4+CD25− cells. The CD4+CD25− cells were preactivated by different stimuli: A, αCD3-beads, the weakest stimulus; B, Soluble αCD3/αCD28, a slightly stronger signal; or C, pbαCD3, the strongest signal. The regulatory cell cultures (containing TdAC) or the “T cell-depleted accessory alone” cultures were given no preactivation (top panel) or were stimulated with αCD3-beads (second from top panel), soluble αCD3/αCD28 (third from top panel), or pbαCD3 (bottom panel). The cultures were combined 15, 38, and 60 h after initial activation, and the assays were performed in triplicate. Proliferation was measured after 5 days of total culture, regardless of when the samples were cocultured, as described in Materials and Methods. This is representative of three repeat experiments that were performed using cells isolated from different donors. The results were practically identical except the cells from one donor did not respond to soluble αCD3/αCD28 stimulation. In the next series of experiments, responder T cells were activated with soluble αCD3/αCD28, a slightly stronger stimulus than αCD3 beads (Fig. 2⇑B). The addition of CD4+CD25+high regulatory T cells activated by the different stimuli resulted in suppression of responder CD4+ T cell proliferation in all cases, but only if the cocultures were initiated within 15 h after activation. The sensitivity of these CD4+ responder cells preactivated with soluble αCD3/αCD28 to inhibition is much different from that exhibited by the CD4+ T cells stimulated with αCD3 beads, indicating different kinetics of suppression. In this study, suppression occurred when coculture was initiated within 15 h, indicating that responder CD4+ T cells became resistant to regulation more quickly when they were stimulated with a stronger TCR stimulus. In the next series of experiments, the responder T cells were activated with pbαCD3, a strong nonpermissive stimulus (Fig. 2⇑C). In general, the regulatory CD4+CD25+high T cells did not suppress the highly activated CD4+ responder cells, although these regulatory cells were capable of suppressing CD4+ cells stimulated with weaker stimuli. As an exception, the addition of CD4+CD25+high cells that had been preactivated with soluble αCD3/αCD28 did suppress the pbαCD3-stimulated responder T cells by ∼50% if coculture was initiated 15 h after activation. Thus, stimulation with soluble αCD3/αCD28 produces regulatory cells with the highest levels of suppressive activity. The supernatants isolated from these timed cocultures were tested for the presence of IFN-γ (Th1), IL-13 (Th2), and IL-10 as shown in Fig. 3⇓. IL-10 was only reproducibly detected in supernatants from cocultures established with responder cells stimulated with pbαCD3. Furthermore, we could not detect IL-10 from cultures of regulatory cells alone unless IL-2 was provided in addition to strong TCR stimulation (data not shown). In general, the secretion of IL-13 and IFN-γ in these cocultures was similar to their corresponding proliferation profiles. The strongly stimulated responder cells exhibited the least inhibition of cytokine secretion, while the more weakly activated responder cells exhibited greater inhibition upon coculture with the differentially preactivated regulatory cells. Supernatants taken from the separate stimulation and timed cocultures were analyzed for their content of IFN-γ (nanograms per milliliter), IL-13 (nanograms per milliliter), and IL-10 (nanograms per milliliter) cytokines by ELISA. The amounts of these cytokines secreted into the media during timed coculture of the indicated preactivated CD4+CD25− responder T cell with differentially stimulated TdACs (○) or CD4+CD25+high cells (•) are compared. The profiles indicating the amount of IFN-γ present is shown directly above the profiles indicating the levels of IL-13 secretion for the same cultures. 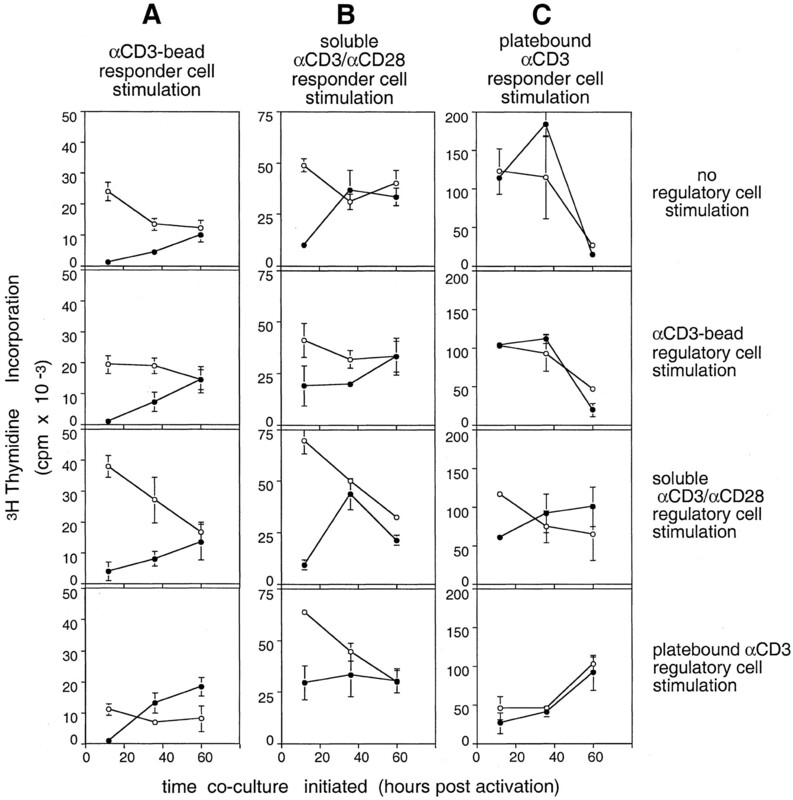 The responder cells were stimulated with αCD3-beads (A), soluble αCD3/αCD28 (B), or pbαCD3 (C). As IL-10 was detected only in cocultures of CD4+CD25− cells that had been stimulated with pbαCD3, only the IL-10 produced by these responder cell cocultures is shown (D). The IL-10 secretion was determined in two independent experiments, using cells from different donors, and demonstrated highly similar results. Cocultures established with pbαCD3-stimulated responder T cells demonstrated inhibition of cytokine production in the absence of coincident inhibition of proliferation. 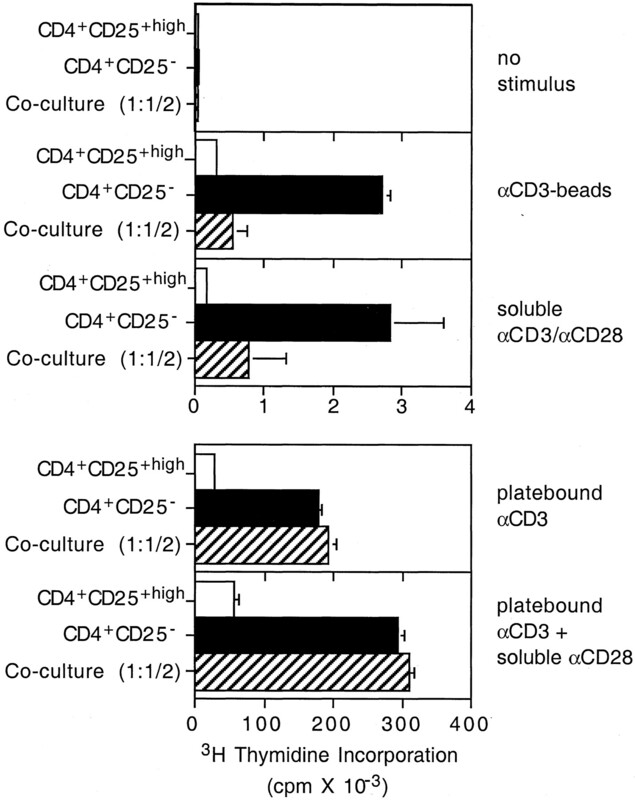 The cocultures established with strongly preactivated responder cells (pbαCD3, Fig. 3⇑C) and regulatory cells (pbαCD3) exhibited no reduction in proliferation, yet showed modest inhibition of IL-13 and IFN-γ production. In contrast, cocultures of the same strongly activated responder cells with the soluble αCD3/αCD28 activated CD4+CD25+high cells exhibited marked inhibition of cytokine production if they were established by 15 h, similar to their proliferation profile. Cocultures established with the weakest preactivated regulatory cells (αCD3 beads) exhibited a small but consistent reduction in IL-13, while there was no suppression of IFN-γ secretion. Lastly, there was no inhibition of either cytokine by cocultures with CD4+CD25+high cells that had not been preactivated. Thus, in cocultures with strongly activated responder T cells, the stronger the preactivation stimulus provided to the CD4+CD25+high cells, the more capable they were of inhibiting the secretion of cytokines for longer periods of time. In contrast, all the cocultures that wereestablished with the more weakly activated responder T cells (αCD3 beads in Fig. 3⇑A, soluble αCD3/αCD28 in Fig. 3⇑B) exhibited significant reduction in the secretion of both IL-13 and IFN-γ regardless of the preactivation status of the cocultured regulatory cells. These data suggest that there is an interval of time after activation during which CD4+CD25− T cells are sensitive to regulation of their cytokine production. Furthermore, the length of this interval directly depends upon the strength of the signals that the different T cells encountered. As IL-10 was only detected in the cocultures established with pbαCD3-stimulated responder cells, Fig. 3⇑D depicts only the IL-10 produced by this stimulation condition. The addition of regulatory cells was not required for production of IL-10, as it was found in cocultures receiving the TdAC-only cultures, indicating that the responder CD4+CD25− cells are secreting the IL-10. Cocultures of CD4+ T cells receiving CD4+CD25+high and TdAcs alone that had received either no preactivation or αCD3 bead stimulation produced the most IL-10. The addition of all CD4+CD25+ regulatory cells, except those stimulated with αCD3 beads, to pbαCD3-stimulated CD4+ responder cells resulted in either no change or increases in IL-10 production. In contrast, αCD3 bead-stimulated CD4+CD25+high cells consistently suppressed IL-10 secretion. Thus, it would appear that although both αCD3 bead and soluble αCD3/αCD28 preactivated regulatory cells can suppress the production of IL-13 and IFN-γ, only the αCD3 bead preactivated regulatory cells inhibit the production of IL-10. Thus, subtle differences exist between regulatory cells depending upon the nature of the activation stimuli. Cocultures of responder and regulatory cells stimulated with soluble αCD3/αCD28 demonstrated no change in the extent of the inhibition, regardless of the presence of mouse IgG1, αTGF-β, or αGITR (Fig. 4⇓B). In contrast, stimulation of cocultures with αCD3-beads produced a slight but consistent diminution from 91% suppression with control Ig to 78% suppression in the presence of αGITR (Fig. 4⇓A). In contrast, the addition of either the monoclonal αTGF-β or polyclonal chicken αTGF-β did not affect the inhibition. Thus, although blocking GITR resulted in a markedly increased level of responder cell proliferation to both types of stimuli, it only slightly reduced the inhibition in those cocultures that had received αCD3 bead stimulation. The effect of neutralizing GITR or TGF-β Abs on the ability of CD4+CD25− cells to proliferate in differentially stimulated cocultures with CD4+CD25+high cells. The proliferation of CD4+CD25− cells only (▪) or cocultures with CD4+CD25+high (▨) and CD4+CD25− cells at a 1:1/2 ratio against αCD3-beads (A) or soluble αCD3/αCD28 (B) in the presence of control Ig or specific neutralizing Abs at 10 μg/ml is shown. The proliferation for cultures of CD4+CD25+high only cultures was negligible in all cases, and thus is not shown. The data are representative of repeat experiments performed using cells isolated from different donors. Having demonstrated that regulation in part depends on the strength of TCR signals delivered by different physical presentation of Abs to CD3 and/or CD28, we next attempted to determine whether the strength of the signal in an Ag-specific system would also alter the level of suppression mediated by CD4+CD25+high T cells. The ability to address this question is a function of T cell precursor frequency for the Ag to be examined. For example, previous studies from our laboratory have demonstrated that human CD4+ T cell responses to myelin basic protein are found in ∼1/106 CD4+ T cells. Analysis of such responses and their subsequent inhibition would be very difficult in light of the limiting numbers of CD4+CD25+high cells that can routinely be isolated. We found that the frequency of T cells reactive to GA, which is a collection of random polymers of glutamate, lysine, alanine, and tyrosine, is relatively high (up to 1/5000 CD4+ T cells) (15). Furthermore, we and others have shown that an in vitro primary response against GA can be generated from cells isolated from normal healthy controls without immunization. To ascertain whether CD4+CD25+high cells could inhibit Ag-specific responses, the fewest CD4+CD25− cells that could be seeded per well and give 100% response was determined to be 1 × 104. To assess the ability of CD4+CD25+high cells to suppress responses to GA as a model Ag, cocultures were established at a 1:2 (regulatory:responder) ratio at two different concentrations of GA to mimic high and low signal strength conditions (16). CD4+CD25+high cells inversely suppressed the proliferative response to GA in a dose-dependent fashion (Fig. 5⇓). That is, with higher doses of GA, there was less suppression by regulatory CD4+CD25+high cells. There was no suppression of the no-Ag cultures since they were at background levels even without the addition of regulatory cells. The response of CD4+ responder T cells against low-dose GA is inhibited to a greater extent than against high GA concentration upon coculture with CD4+CD25+high cells. The responses of CD4+CD25− (▪), CD4+CD25+high (•), and cocultures (▴) against two doses of GA (40 and 100 μg/ml) were assayed after 7 days in vitro. [3H]Thymidine was added to the cultures at day 7 and harvested after 16–18 h. The assays were performed in quadruplicate and triplicate, the symbols represent the means of the total proliferative response, and the errors represent SEM. This has been repeated >3 times with cells isolated from different healthy donors; all repeats demonstrate suppression of GA responses that decreases at high Ag dose. CD4+CD25+high T cells are potent regulators of autoreactive T cells. Multisystem autoimmune disease results from deletion of these regulatory T cells early in postnatal life, while exacerbation of autoimmune diabetes has been shown to occur in NOD/CD28−/− mice that are deficient in this cell population (17). However, it is unclear how regulatory CD4+CD25+high cells still allow systemic immune responses to inflammatory events. In doing so, regulatory T cells must discriminate those immune responses that are desirable from those that are deleterious. In this study, we created an in vitro model that allowed differential activation of regulatory CD4+CD25+high and responder CD4+ T cells. Responder CD4+ T cells become refractory to suppression by regulatory CD4+CD25+high cells as a result of strong engagement of the TCR by either prolonged anti-CD3 stimulation or interaction with high concentrations of Ag/HLA-DR complexes. Thus, our data suggest that CD4+CD25+high regulatory T cells will suppress the physiologic activation of autoreactive T cells associated with low strength of signals, while T cells activated during inflammatory responses associated with high strengths of signals will be refractory to this mechanism of suppression. Moreover, these data demonstrate that contact of the regulatory cell with responder cell does not have to be coincident with responder cell activation for suppression to occur. Thus, since the responder CD4+ cells remain sensitive to regulation for a length of time after their activation, the low number of CD4+CD25+high cells have a prolonged opportunity to contact and inhibit the full activation of potentially autoreactive CD4+ T cells. This “window of inhibition” is directly related to the strength of TCR signals experienced by both the responder and the regulatory T cells. The suppression mediated by nonpreactivated regulatory cells was less complete than that mediated by weakly preactivated regulatory cells. Unstimulated CD4+CD25+high regulatory cells isolated ex vivo were observed to suppress the proliferation and cytokine production by weakly activated CD4+ responder T cells. However, the nonpreactivated regulatory cells were less able than those that were given some means of preactivation to affect the cytokine secretion by strongly activated responder T cells. Thus, while it is possible that CD4+CD25+high regulatory cells are capable of directly suppressing ex vivo, it is most likely that unstimulated CD4+CD25+high regulatory cells were activated by residual anti-CD3 stimuli at the time the cocultures were established. It has recently been shown that human CD4+CD25+ T cells require activation to regulate CD4+ cells. Specifically, human CD4+CD25+ regulatory cells that were activated and fixed still inhibited responder CD4+ cells, while resting and fixed CD4+CD25+ regulatory cells were not functionally competent to suppress (18, 19). Together, these data suggest a change on the surface of activated CD4+CD25+ that is important for their regulatory function. Our data suggest that the expression or change in expression of this molecule on the cell surface is affected by the type of TCR signal delivered to the regulatory cell, as differentially stimulated regulatory cells demonstrate altered capacity to inhibit proliferation or cytokine production. It was important to examine whether changing the strength of signal delivered by a peptide MHC complex through the TCR also influenced regulatory/responder T cell function. We took advantage of the random copolymer Ag GA to evaluate the capacity of CD4+CD25+high regulatory T cells to mediate Ag-specific suppression. GA was chosen because a relatively high frequency of HLA-DR-restricted CD4+ T cells respond to the peptide complex and higher in vitro concentrations lead to higher T cell activation states (15, 16). Increasing the Ag concentration is equivalent to increasing the strength of the signal delivered by αCD3 stimulation. We found that responder CD4+ cells were less responsive to suppression via CD4+CD25+high regulatory cells with increasing concentrations of GA. Thus, although similar to our results with increasing αCD3 stimulation, the results with increasing Ag-specific activation may reflect the more physiologic MHC/Ag engagement of the TCR as it occurs in vivo. Our data highlight how subtle changes in T cell activation protocols result in marked differences in T cell function. Different physical methods of Ab presentation, the use of different αCD3 Abs, the use of serum or serum-free media, and the presence or absence of accessory cells all have different effects on T cell activation. Thus, a strong stimulus that has been defined as optimal for T cell growth will likely become a weaker suboptimal stimulus if the T cells are cultured in the absence of serum and feeders. This assumption is supported by recent data using a serum and accessory cell-free system where a 100-fold more responder cells were required to achieve similar levels of proliferation (19). A number of groups demonstrate suppression under conditions of pbαCD3/soluble αCD28 stimulation, while others do not. This fact is likely related to the in vitro conditions regarding the presence of serum and APCs (3, 8) (18, 19, 20). In the studies presented in this report, conditions such as serum and APCs were held constant so that TCR engagement could be studied in its least artificial in vitro state. These data suggest that different strengths or modes of stimulation may alter the mechanism by which CD4+CD25+high cells regulate immune responses. Different modes of action are suggested by the finding that αCD3 bead-stimulated regulatory cells inhibited IL-10 production, while regulatory cells stimulated with the stronger stimuli, which suppressed cytokine production and/or proliferation of various target T cells, did not suppress IL-10 secretion. Differentially stimulated regulatory cells also exhibit differences in their abilities to inhibit strongly stimulated responder cell proliferation (soluble αCD3/αCD28 regulatory cells) or to function through a manner that is sensitive to inhibition by blockade of GITR (αCD3 bead stimulation). Thus, it is likely that CD4+CD25+high cells use multiple methods to regulate differentially triggered target T cells. The ability of CD4+CD25+high regulatory cells to secrete the immunosuppressive cytokines TGF-β or IL-10 and their involvement in regulation are unclear (3, 5, 6, 10, 21). We have not been able to detect IL-10 secretion from cultures of CD4+CD25+high cells alone under conditions in which they can suppress CD4+ responder cells. This discrepancy with other reports may be due to our use of a highly pure population of regulatory cells that are isolated by cell sorting instead of magnetic bead isolation, and results in a CD25+ population that is >98% CD45RO+, which has been shown to distinguish cells with suppressive activity (5). Nakamura et al. (10) suggest that the cell contact in these cocultures is necessary for the responding T cells to interact with membrane-bound TGF-β on the cell surface of CD4+CD25+ cells. Yet, completely functional and suppressive CD4+CD25+ cells have been isolated from spleens of IL-10−/− mice and from thymocytes of neonatal TGF-β−/− mice (3, 22). Recent reports suggest a model of “infectious tolerance” in which the CD4+CD25− T cells that have interacted with CD4+CD25+ cells become anergic and tolerogenic themselves via a mechanism that involves autologous production of TGF-β and IL-10 (18, 19). However, our data indicate that while interaction with CD4+CD25+ cells may lead to CD4+ cell anergy, it may not always lead to the generation of tolerogenic CD4+ cells that can suppress other cells through the secretion of immunosuppressive cytokines. Because IL-10 was secreted in cocultures that show no inhibition themselves, the secretion of IL-10 appears to result from the type of stimulation and not from the presence of functionally suppressed or anergized target T cells. This conclusion is emphasized by the inability to identify IL-10 secretion in the suppressive cocultures established with αCD3 bead- or soluble αCD3/αCD28-stimulated responder cells. Thus, not all suppressive interactions result in the production of tolerogenic CD4+CD25− cells suppressing through IL-10. We are currently investigating whether the CD4+CD25− cells cocultured under weakly stimulatory conditions with the CD4+CD25+high cells may in fact be tolerogenic, but through a different mechanism. In summary, we generated an in vitro model in humans that allowed differential activation of regulatory CD4+CD25+high and responder CD4+ T cells. Responder CD4+ T cells become refractory to suppression by regulatory CD4+CD25+high cells with strong engagement of the TCR by either prolonged αCD3 stimulation or high concentrations of Ag/HLA-DR complexes. Our data are consistent with a model where CD4+CD25+high regulatory T cells suppress the physiologic activation of autoreactive T cells associated with low signal strength while T cells activated during inflammatory responses associated with high signal strength are refractory to this mechanism of suppression. We thank Robert McGilp for consistently performing expert flow cytometric isolation of the highly pure regulatory and responder T cell populations. ↵1 The work was supported by National Institutes of Health Grants UO1DK6192601, RO1NS2424710, PO1AI39671, and PO1NS38037, and Grants RG2172C9 and RG3308A10 from the National Multiple Sclerosis Society. ↵3 Abbreviations used in this paper: GITR, glucocorticoid-induced TNFR; GA, glatiramer acetate; pb, plate-bound; TdAC, T cell-depleted accessory cell.